Or view larger version. Police Chief Edward M. Toothman got between marchers and anti-VDC demonstrators in background. November 21, 1965. Lonnie Wilson, photographer. Gelatin silver print. Collection of Oakland Museum of California. The Oakland Tribune Collection. Gift of ANG Newspapers. 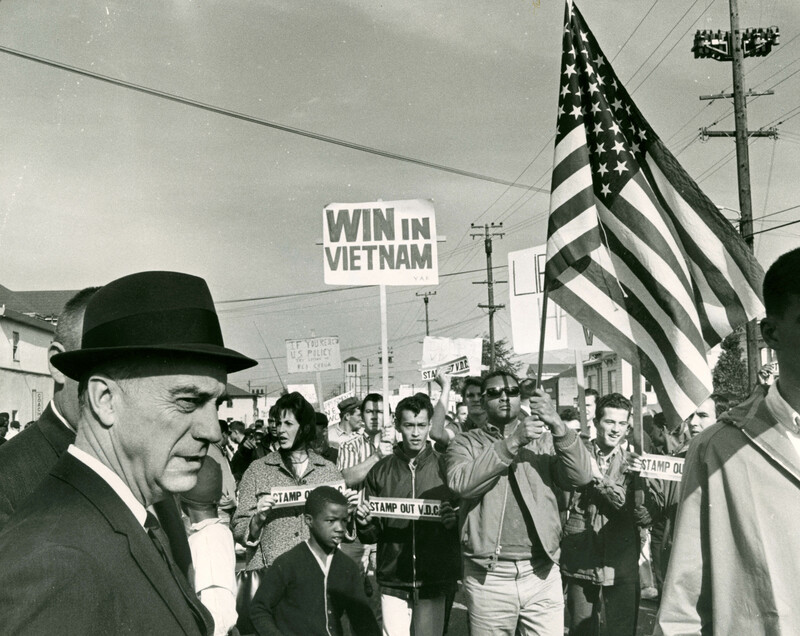 This photo was taken at the time of a large protest march against the Vietnam War on November 21, 1965. The march was organized by the Viet Nam Day Committee (VDC) and began at the U.C. Berkeley campus, making its way to deFremery Park in Oakland. As the marchers left Berkeley, counter protesters began walking in front carrying banners supporting the U.S. policy in Vietnam and denouncing the VDC. The pro Vietnam policy marchers swelled to more than 400 persons before eventually being forced off the street by police.